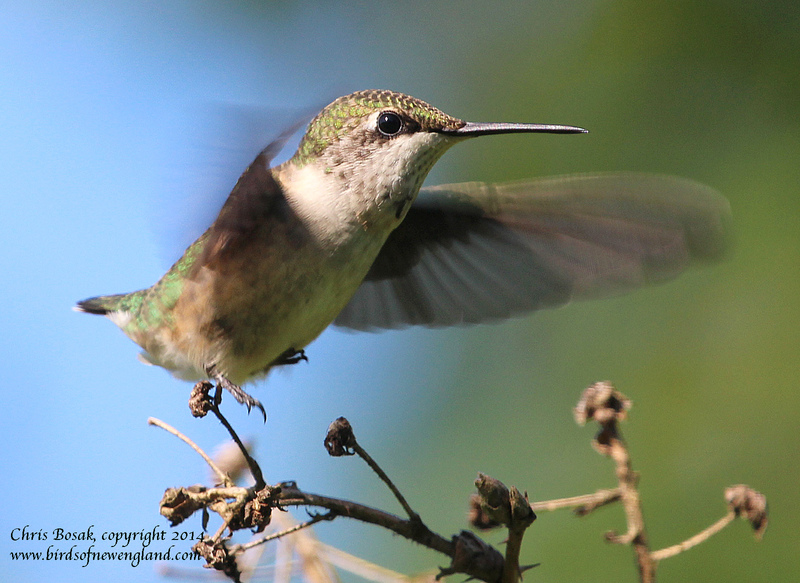 A female Ruby-throated Hummingbird takes off from a perch in Norwalk, Conn., summer 2014. Last week, I wrote about the hummingbirds visiting my feeder this summer. Hummingbirds, however, are much too interesting to be limited to one column. This week, I’ll focus on facts about these tiny dynamos. Fun facts, of course, not just any old boring facts. Before those facts, let me start with this … I ended my column last week by requesting from readers input about which flowers attract their hummingbirds. I received an email from Carol, who relayed some interesting information. In addition to the flowers I mentioned in my last column, Carol said at her place pink phlox, gladiolas, perennial sweet peas, coleus flowers and morning glories do the trick. “My special joy is watching them fly through the sprinkler and seeming to really enjoy their own personal showers. They are really amazing creatures,” Carol wrote. Marsha wrote to say that petunias and fuchsia hanging in a basket bring the little birds in. She added, however, that neighbor’s feeders are busy, but they tend not to visit hers. Sometimes the bird world is unpredictable, even frustrating. Pam from Walpole added trumpet vine and blue lobelia to the list. Donna, who has a place on Granite Lake, wrote to say her hummingbirds are attracted to a hanging tri-level flower pot arrangement with mellow yellow cuphea. Stephen sent in a picture of a bird on his hummingbird feeder. It was a downy woodpecker, not a hummingbird. That is not a common occurrence, but not terribly rare either. Woodpeckers, warblers, thrushes and some other species can sometimes be spotted at hummingbird feeders. Remember, Baltimore orioles can be attracted to a nectar feeder as well, but with a different mixture of water and sugar. Hummingbird nectar is four parts water to one part sugar; oriole nectar is less sweet at eight parts water to one part sugar. You may also need a special oriole feeder. Now for some of those facts I promised — in no particular order. There are more than 300 hummingbird species, and each one makes different humming noise with its wings. Imagine being so good at birdwatching you tell each one by the humming of its wings. Hey, many birders know the woodpecker species from its knocking, so why not? Of those more than 300 species, only eight regularly breed in the U.S. — and only one east of the Mississippi River. Most hummingbirds are tropical and do not migrate. They are strictly a Western Hemisphere bird so don’t go to Europe, Asia or Africa and expect to see hummingbirds. Hummingbirds can flap their wings up to 90 times per second — and even faster during courtship. Many birds can hover, but hummingbirds are the only birds that can fly backwards. Hummingbirds double their weight before taking off for their incredible migration over the Gulf of Mexico. Hummingbirds have tiny feet and far fewer feathers (only about 1,000) than most birds to help them fly easier. By comparison, the Mallard has about 12,000 feathers. If you started putting ruby-throated hummingbirds on a scale (for whatever reason) you would have to place 150 of them for it to read one pound. Hummingbirds are aggressive not only toward other hummingbirds but also birds such as hawks, blue jays and crows. In other words, don’t mess with a hummingbird. This entry was posted in hummingbirds and tagged birding columnist Chris Bosak, hummingbird, Ruby-throated hummingbird by Chris Bosak. Bookmark the permalink. Thanks for all the interesting information about Hummingbirds. I really enjoyed all the Awesome pictures as well!!! Loving this series.. I have been regaled with those hummers this past few weeks… They come humming right up to my face, looking right AT me! And when I’ve been late to replace the feeder because it’s in the sink soaking or I’m waiting for the syrup mix to cool… They come to the spot where it should be… And chatter chatter – sometimes looking in my window at me as if to say ‘yeah, hurry up there, we’re waiting..’. I have about 5 or six flying between feeder, trumpet vines and Japanese honeysuckle and bee balm. Once a hummingbird did the pendulum dance up to me and back several times in a huge arc… That was a WOW moment! Thanks again for this column!